Kpreps Game Day feature is designed to provide you with a program for things to watch out for in Week 1 action. If you have suggestions for what you would like to see in future Game Day features, send us a message on Twitter or Facebook. A pair of cities known for hosting some of the state’s more successful high school football programs are looking to rebound in 2017 after an unusual down year. Traditional Class 5A powers Salina Central and Salina South are trying to recover from a rare season where both schools entered their head-to-head regular season finale in Week 8 without a win. South bested Central 28-13 last season to earn it’s only win of the season, while the Mustangs finished 0-9. Meanwhile, Salina Sacred Heart dropped six of its past seven games during the 2016 season to finish 3-6. Historically, these three teams are among the state’s leaders in number of playoff appearances with Sacred Heart and Salina Central each having 26, and Salina South having reached the postseason 19 times. Across the state in suburban Kansas City, the four Olathe schools will look to improve upon a 2016 season that saw them post a combined 13-24 record. Olathe North, Olathe East, and Olathe South have each posted at least a .600 winning percentage over the past 13 seasons, while Olathe Northwest has won 37 percent of its games over that time. East, North, and Northwest all finished 3-6 last season, while Olathe South finished one game better at 4-6. Olathe South and Olathe East each dropped their 2017 opener on Thursday night. The Falcons fell 28-6 to Shawnee Mission East, while Olathe East fell 22-21 to Hutchinson. 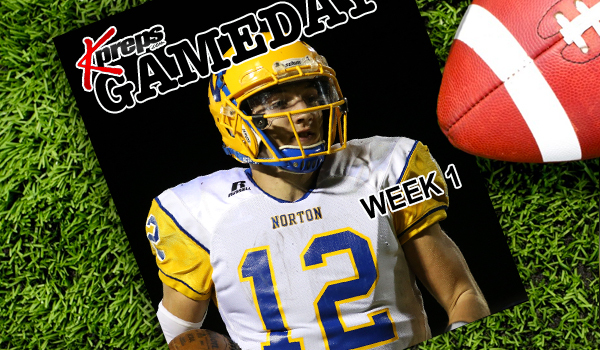 Class 3A Norton versus 4A-II Goodland is headlined by the quarterbacks. Norton has four-year starter Jace Ruder, a North Carolina commit. Goodland features senior Levi Archer, a multi-year starter who has received interest from multiple colleges at different levels. While both are known for their passing, Ruder is a great run threat, including the second-best running performance of his career last fall in a 42-7 win against Goodland. Ruder rushed for 113 yards and two scores. It marked the first 100-yard rushing performance of his career. Ruder set a new career high later in the fall with 146 rushing yards versus TMP. Norton dominated the game, and Goodland tallied its only points in the fourth quarter. Tevin Petrie tallied 125 rushing yards for the Bluejays. Ruder finished with 114 carries for 746 yards and 16 rushing scores, while Petrie had 155 rushes for 1,108 yards and 12 rushing TDs. Norton averaged 6.1 yards per carry in ’16, which actually dropped from 6.9 yards per carry in ’14 and 6.8 in ’15. Containing Ruder’s running ability is likely going to be key for Goodland. Before last season, the teams last played in ’13, a game Goodland won, 30-7. In that contest, the Cowboys limited Norton to 39 rushes for 61 yards. The CNC League opener between rivals Frontenac and Girard has a new storyline this season as a pair of former Division II All-American quarterbacks will square off on the sidelines. New Girard coach Neal Philpot, a Norton native, was a four-year starter at Pittsburg State (2001-04) where he earned All-American honors and set MIAA Conference and school records for total offense (10,168) and career rushing yards (4,337) as a quarterback. Philpot spent ten seasons as an assistant at Pitt State before serving as the offensive coordinator at Ottawa University the past two years. Philpot’s Trojans will square off against Mark Smith’s Frontenac Raiders. Smith was also an All-American quarterback at Pitt State (2006-08); starting as a sophomore in 2006 before being injured mid-way through the season. Smith’s career at Pitt State places him in the top four in total yards, passing, and rushing by a QB in addition to being the most accurate passer in school history. In his 6th year at Frontenac, Smith has led the Raiders to a 38-15 record and energized a tradition-rich program that was just 13-25 the four seasons prior to his arrival. Last season, Central Plains defeated Victoria, 48-22, behind a huge performance from Alex Barton, who eventually went to earn all-state honors. Against a brand-new Knight secondary, Barton hauled in nine passes for 204 yards and two scores as Devin Ryan delivered a standout first game as starting quarterback. Central Plains held a 264-17 edge in the passing game. This year, Barton, a senior, and Ryan, a junior, both return. So does the Knights’ primary playmakers with senior quarterback Collin Kisner (1,210 rushing) and senior running back Cooper Pfanenstiel (703 rushing). Central Plains has collectively allowed 11.7 points per game in the last three seasons, the best mark in eight-man football (Victoria is seventh at 18 points permitted a game). Central Plains did struggle versus the Knights’ rushing attack. Victoria rushed 42 times for 200 yards. The Oilers permitted 349 rushing yards in a playoff loss to Spearville, and 242 in a comeback win against Otis-Bison. Against Argonia-Attica, Little River and Ness City – all playoff qualifiers – Central Plains collectively permitted 186 total rushing yards. The Oilers held Ellinwood, a team that missed the playoffs but averaged 33.6 points a contest, to just five rushing yards. The Central Prairie League rivals are 3-3 against each other since 2011, and the home team has won the last three contests. Tonight kick off the final season for the Kaw Valley League. Three members of the Kaw Valley League, Basehor-Linwood, KC Turner, and Lansing agreed to join the newly formed United Kansas League along with De Soto, Leavenworth, and Shawnee Heights. That decision, along with Bishop Ward’s decision to join the Crossroads League, left remaining Kaw Valley schools Bonner Springs, KC Piper, and Tonganoxie searching for a place to land. They have all accepted invitation to join the Frontier League next season. The curtain call for the Kaw Valley League begins with Bishop Ward visiting defending league champion Basehor-Linwood. The Ward Cyclones have lost 29 consecutive games – the longest current streak in the state. Elsewhere, Bonner Springs hosts KC Turner in another KVL matchup, while KC Piper and Tonganoxie visit future Frontier League foes. The Pirates open the season at Paola, while the Tongy will travel to Spring Hill. Lansing will host nearby rival Leavenworth – a game the Lions won 30-28 last season. Congratulations to Lawrence High coach Dirk Wedd on picking up his 100th win last night with a 42-21 victory over Shawnee Mission Northwest. Coach Wedd (100-72) announced that he would retire after the 2017 season after more than 40 years in the teaching/coaching profession.